April 2017 – Representatives from countries across Asia met at a subregional workshop in the city of Surabaya in eastern Indonesia last month to share best practices on strengthening the management of hazardous chemicals. Hosted by the Government of Indonesia, the Asia-Pacific Plant Protection Commission (APPPC) and the Rotterdam Convention (RC) Secretariat of FAO, at least 33 participants from nine countries attended the event, including several newly appointed Designated National Authorities (DNAs). DNAs are responsible for sharing information with the RC Secretariat and other participating countries, as well as partners such as those working in the trade and export industries. “Each country came prepared with a country report, giving a clear picture of where they stand in terms of pesticide and chemicals management at a national level and presented specific ideas on the implementation of the RC,” said Yun Zhou, FAO Agricultural Officer for the Convention. As a large exporting country, the representative for China explained how it met its obligations under the Convention; while Nepal and Lao PDR, two countries heavily reliant on imports, and considered vulnerable to pesticide exposure acknowledged the problematics they faced. Nepal said many of those dependent on agriculture viewed pesticides as a form of “medicine” for pest management and were therefore, not aware of the hazards they posed. Attendees from China, Lao PDR, India, Indonesia, Malaysia, Nepal, Thailand, Sri Lanka and Vietnam received practical training on the operational elements of the Convention including how to submit notifications of final regulatory action and reports on incidents caused by pesticide formulations. A key challenge for countries is to balance the benefits and risks when taking national decisions on chemicals. The newly launched FAO Pesticide Registration Toolkit, which helps countries to make sound decisions on pesticides – in particular those lacking adequate infrastructure – was also introduced. The common goals of the RC and the APPPC are to safeguard plant, human health and the environment while facilitating trade and protecting the sustainability of agriculture. 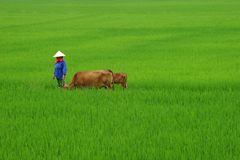 Agricultural growth in Asia has stagnated in recent years, with a serious decline in investment, and a depletion and degradation of natural resources in the face of continued population growth. Moreover, 60 percent of the world’s hungry live there. In order to address these issues, FAO’S Representative for Asia and the Pacific, Kundhavi Kadiresan recently called for a renewed focus on reaching the most marginalized people, the very poor and those living in remote areas. FAO is collaborating closely with Indonesia to streamline ecosystem approaches into the nation’s agricultural practices. The Organization’s Regional Rice Initiative in Indonesia focuses on the importance of goods and services produced by rice ecosystems and promotes sustainable rice production practices to enhance resilience and increase efficiencies in order to improve food security and nutrition. The UN’s Sustainable Development Goal 12 (SDG 12) centres on ensuring sustainable consumption and production patterns. Fulfilling this target requires minimizing the natural resources and toxic materials used, and the waste and pollutants generated throughout the entire production and consumption process. Building partnerships between countries to manage chemicals safely is regarded as pivotal in achieving the 2030 Agenda. A follow-up project to monitor highly hazardous pesticides in the context of the RC and to identify sustainable alternatives based on the ecosystem approach will begin in Lao PDR later this year.